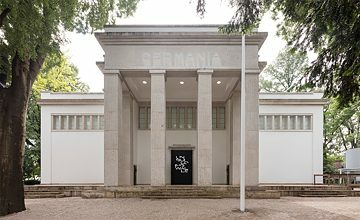 “Unbuilding Walls” is the German Pavilion’s contribution to the 2018 Venice Biennale. The exhibit takes on the history of the Berlin Wall to explore what happens when borders dissolve. Every two years, Venice hosts the Biennale Architetturainternational architecture exhibition. Berlin-based Graft Architects and former GDR civil rights activist Marianne Birthler are curating this year’s German Pavilion. The Unbuilding Walls exhibit explores the implications of a divided Germany and the history of the Berlin Wall – events that are closely linked to curator Birthler’s personal history. In her role as the former Federal Commissioner for the Records of the Ministry of State Security, East Germany’s secret police known as the Stasi, she engaged with and processed the German Democratic Republic’s history. Thomas Willemeit is a member of the Graft Architecture team and provided some insight into the exhibit. 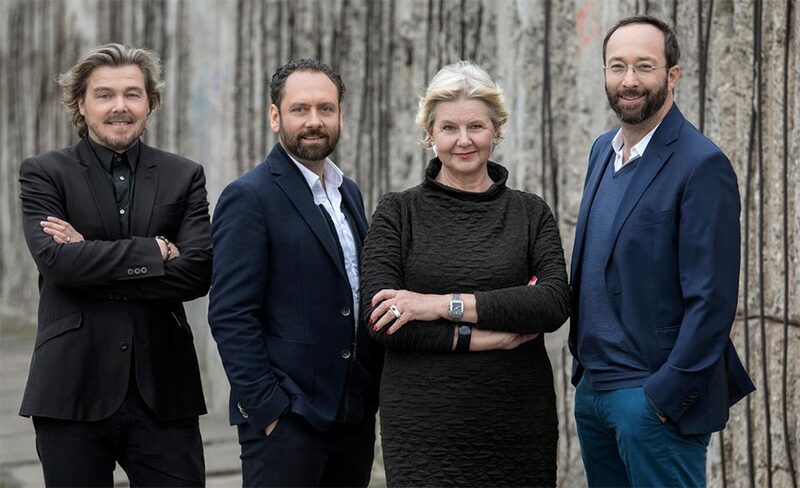 The German pavilion curators (from left to right): Lars Krückeberg, Thomas Willemeit, Marianne Birthler and Wolfram Putz. | Photo (detail): © Pablo Castagnola In the run-up to the Biennale, expectations were running high about the design of the German Pavilion. What is the exhibit about? The exhibit touches on 28 projects from the two Germanys, the Federal Republic of Germany and the German Democratic Republic, and the part of Berlin allotted to each – West and East Berlin. But we also included borders and walls from all over the world and other sites, like the Iron Curtain Trail, a EU-sponsored cycling path along the former Iron Curtain. It is an exploration of what happened along the former death strip. The exhibit features some of the social concepts intended to reunify the city and the country, and to deal with the giant wound it left behind. 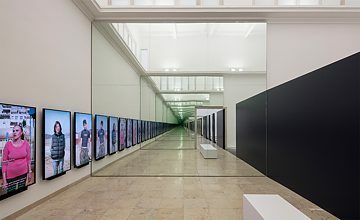 It is a multidimensional event which lends the exhibit a phenomenological effect: As you walk through the pavilion door, you are immediately confronted with a wall reflected in a mirror to seem infinite. As you walk towards it though, it becomes apparent that what looked like an impenetrable border is really a bunch of small wall panels scattered about the space. This is our metaphor: from one angle, you see a border – but borders can be overcome if you change your viewing angle, your standpoint. You and your Graft co-founders Lars Krückeberg and Wolfram Putz worked with politician Marianne Birthler to design the exhibit. How did this constellation come about? I’ve known Marianne for ten years; we live in the same building. Over the years we have had some intense conversations about a few of the sites along the former death strip – which is how the idea for the exhibit first came about. And this year the Wall has been down for as long as it was up, namely 28 years. Our exhibition delves into all aspects of walls, and figuratively it is also about the walls we build in our minds. In her role heading up the Stasi Records Office, Marianne grappled with ways of creating transparency and breaking down the divisions in our minds. We could never have done it without her input. So Marianne Birthler’s personal experience played a key role in the concept design? We wanted to incorporate Marianne’s childhood experience– she witnessed the Wall being built in 1961 when she was 13 years old – into the exhibit. We felt that her experience of an undivided, open Berlin before the Wall went up was essential, as were her memories of when the Wall fell. She was politically active and spoke at the demonstrations in Alexander Square back then. Marianne lived through the entire process from the inside – including the founding of a reunified Bundestag and the the forming of a joint government. You describe the death strip as an open wound. How can architecture be part of the healing process? If you look at what has happened over the past 28 years, you’ll see that the architectural and urban spatial quality of each site we selected stands for a specific approach to overcoming division: In downtown Berlin, the Wall bisected streets, like Zimmerstraße between the Stadtmitte and Kochstraße underground stations. In the 1990s, it was restored to exactly how it had been prior to the wartime destruction. Here the concept was to remove the Wall from our shared memory. In contrast, on another street on the other side of Berlin, Bernauer Straße, the Berlin Wall Memorial was erected, initially through the efforts of citizens and later with strong political backing. Then there are spaces where nothing architectural has happened at all, like the East Side Gallery, where the Wall was covered with colourful graffiti as people celebrated the end of a divided country – and where there is still heated debate today about how to develop the waterfront. These are all very different approaches to configuring the empty space left behind by the Wall, and rendering history visible or invisible. How did this come to pass? There was no top-down concept, no master plan. We as a country did not come together and say, so what are we going to do with this strip of land where the Wall once stood? We just kind of got on with it. In the exhibit we wanted to explore the range of desire and emotional driving forces that have led us here. To a certain extent, it is a psychological profile of the societal processes that we have tried to uncover in the spatial chain of the death strip. Graft’s German office is located in Berlin Mitte, a district that comprises parts of former East and West Berlin. How important is reunification to people today, and where do you still see mental walls? How a shared identity is built is a very individual issue. Reunification is still a pressing topic for some, while it plays a smaller role for others. Some people in what was Wester Berlin say they have no real reason to travel “to the East”. This is not a form of rejection; it is more their way of expressing that the divide doesn’t play a major role in how they live their lives today. Someone who lived in the East will have a completely different take on it, of course. Their lifestyle and living environment has changed drastically, and they probably watched their circle of friends fall apart as they scattered to the four winds because the border was suddenly open. The Biennale exhibit targets an international audience. How do you communicate about this topic with people from all over the world? The international community has taken a great interest in how Germany is being knit back together. People from all over the world come to Berlin to visit the places that memorialize a divided Germany – Mauerpark, Checkpoint Charlie, the Berlin Wall Memorial and the East Side Gallery. They want to understand how this country has managed to overcome its division, and how we are dealing with it today. This curiosity is linked to a desire to break down other borders in this world, something we also address at the Bienale. 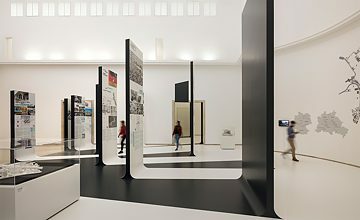 Once visitors have shifted their point of view to pass through the wall, they see the architectural examples and the “Wall of Opinions”, where people who are still forced to live with walls today tell their stories – and answer the question: what would happen if the wall fell? We sent a team of journalists to six borders that divide a country or a people today. This is a very relevant and pressing question right now, for Europe as well, since we have a border around the EU that is growing increasingly fortified. 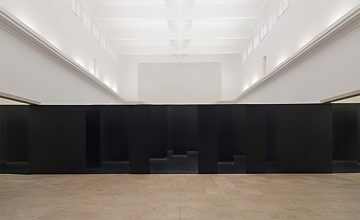 The exterior of the German Pavilion at the Architecture Biennale in Venice. 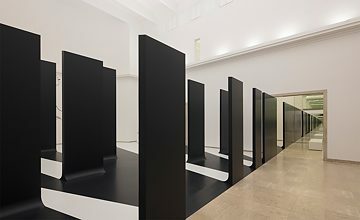 An optical illusion confronts visitors as they enter the pavilion: the wall that seems to be blocking their way is actually dozens of individual, offset panels. What looks like a solid wall is actually individual panels. Exhibit on the history of the Berlin Wall. The “Wall of Opinions” video installation gives voice to people living with physical divides today. Saskia Eversloh is a journalist and communication consultant. She writes for publications the Handelsblatt Media Group and others, and advises the Deutsche Gesellschaft für Internationale Zusammenarbeit (GIZ). Copyright: Text: Goethe-Institut, Saskia Eversloh. This work is licensed under a Creative Commons Attribution – Share Alike 3.0 Germany license.